Citation PODOCARPUS MACROPHYLLUS (Thunberg) D. Don, in Lambert, Descr. Pinus 2: 22. 1824. Basionym: Taxus macrophylla Thunberg 1784. Nageia macrophylla Nageia macrophylla (Thunberg) F. Mueller, Select Pl., German ed. 245. 1883. BASIONYM: Taxus macrophylla Thunberg 1784. Podocarpus macrophyllus forma angustifolius Podocarpus macrophyllus (Thunberg) D. Don, forma angustifolius (Blume) Pilger, in Engler, Pflanzenr. 4(Heft 18): 80. 1903. 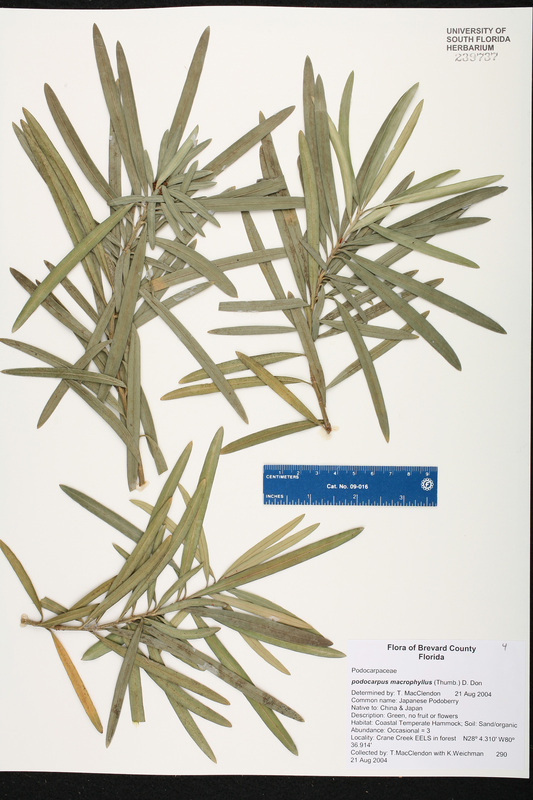 BASIONYM: Podocarpus macrophyllus (Thunberg) D. Don, var. angustifolius Blume 1847. 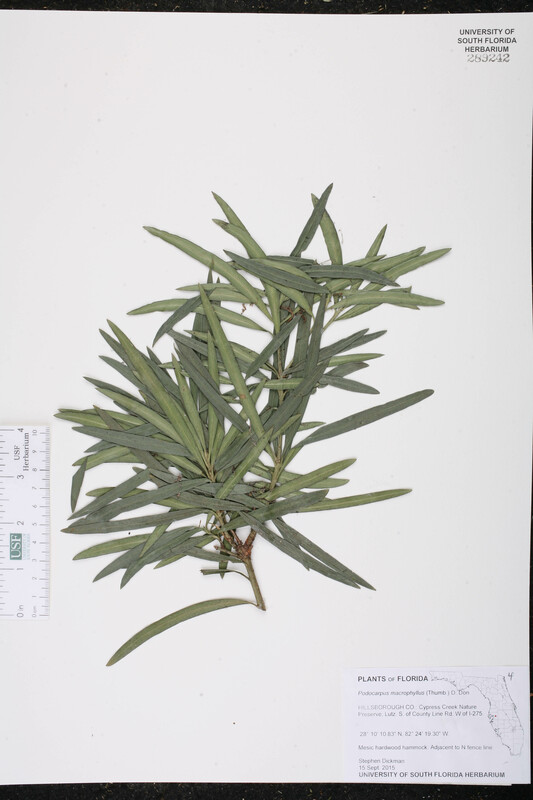 Podocarpus macrophyllus var. angustifolius Podocarpus macrophyllus (Thunberg) D. Don, var. angustifolius Blume, Rumphia 3: 215. 1847. Podocarpus chinensis var. argenteus Podocarpus chinensis Wallich ex Sweet, var. argenteus Gordon, Pinetum, Suppl. 88. 1862. Podocarpus chinensis var. aureus Podocarpus chinensis Wallich ex Sweet, var. aureus Gordon, Pinetum, Suppl. 88. 1862. Podocarpus macrophyllus forma grandifolius Podocarpus macrophyllus (Thunberg) D. Don, forma grandifolius Pilger, in Engler, Pflanzenr. 4(Heft 18): 80. 1903. 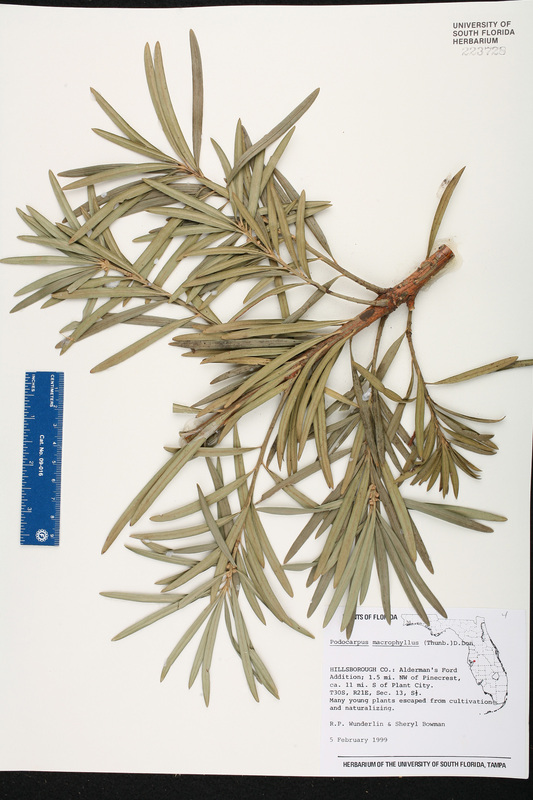 BASIONYM: Podocarpus macrophyllus (Thunberg) D. Don, var. liukiuensis Warburg 1899-1900. Podocarpus macrophyllus var. albovariegatus Podocarpus macrophyllus (Thunberg) D. Don, var. albovariegatus Pilger, in Engler, Pflanzenr. 4(Heft 18): 80. 1903. BASIONYM: Podocarpus chinensis Wallich ex Sweet, var. argenteus Gordon 1862. 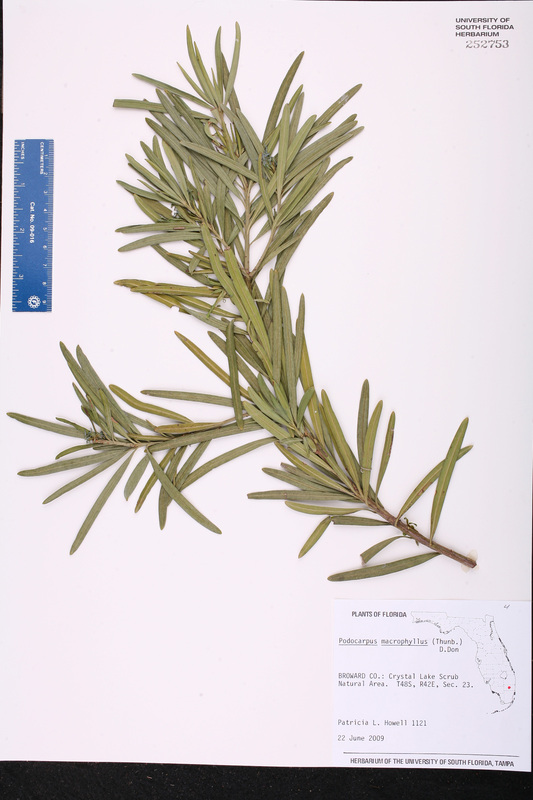 Podocarpus macrophyllus var. chinensis Podocarpus macrophyllus (Thunberg) D. Don, var. chinensis (Wallich ex Sweet) Maximowicz, Mélanges Biol. Bull. Phys.-Math. Acad. Imp. Saint-Pétersbourg 7: 562. 1870. BASIONYM: Podocarpus chinensis Wallich ex Sweet 1826. Podocarpus macrophyllus var. chingii Podocarpus macrophyllus (Thunberg) D. Don, var. chingii N. E. Gray, J. Arnold Arbor. 39: 474. 1958. TYPE: CHINA: Chekiang: 55 Chinese mi. W of Lung-sien, s.d., Ching 2477 (holotype: A). Podocarpus macrophyllus var. liukiuensis Podocarpus macrophyllus (Thunberg) D. Don, var. liukiuensis Warburg, Monsunia 192. 1899-1900. 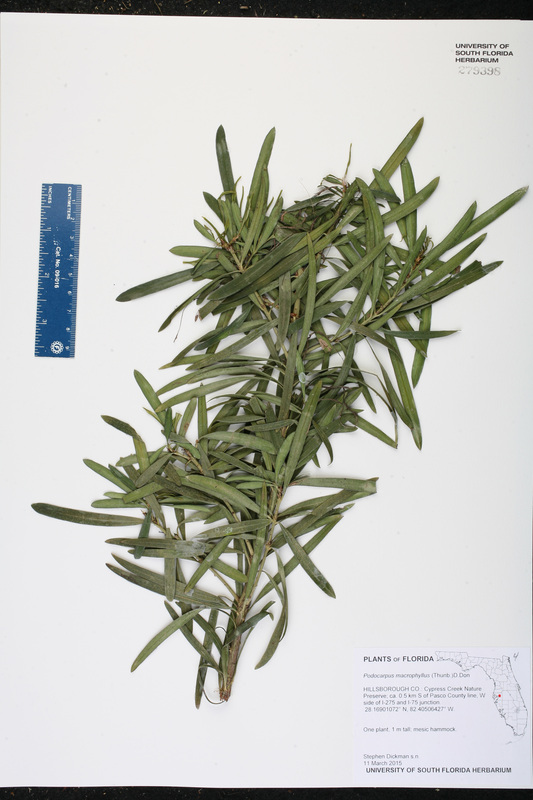 Podocarpus macrophyllus var. luteovariegatus Podocarpus macrophyllus (Thunberg) D. Don, var. luteovariegatus Pilger, in Engler, Pflanzenr. 4(Heft 18): 80. 1903. BASIONYM: Podocarpus chinensis Wallich ex Sweet, var. aureus Gordon 1862. Podocarpus macrophyllus var. maki Podocarpus macrophyllus (Thunberg) D. Don, var. maki (Siebold) Endlicher, Syn. Conif. 216. 1847. 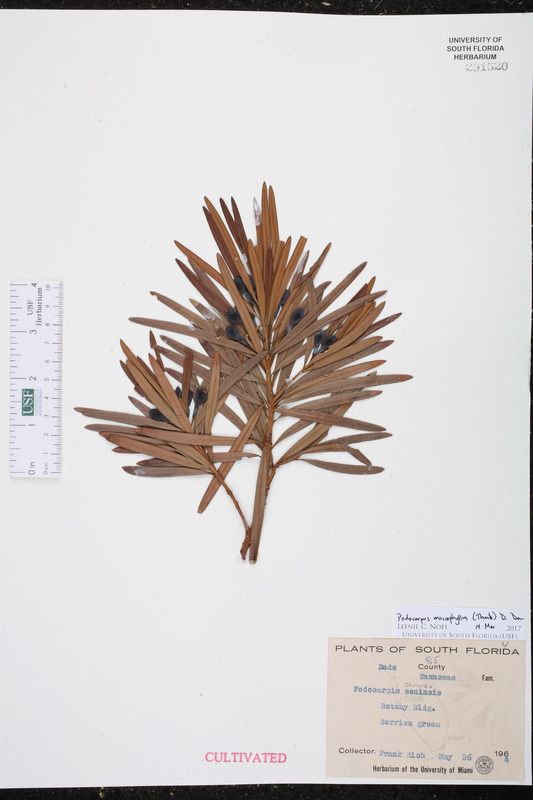 BASIONYM: Podocarpus macrophyllus (Thunberg) D. Don, subsp. maki Siebold 1844. Podocarpus maki Podocarpus maki (Siebold) Siebold & Zuccarini, Abh. Math.-Phys. Cl. Königl. Bayer. Akad. Wiss. 4(3): 231. 1846. 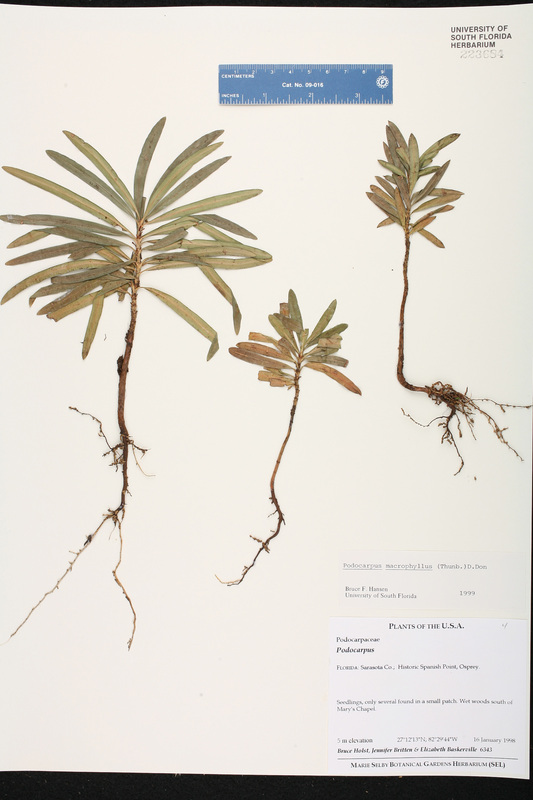 BASIONYM: Podocarpus macrophyllus (Thunberg) D. Don, subsp. maki Siebold 1844. Podocarpus makoyi Podocarpus makoyi Blume, Rumphia 3: 216. 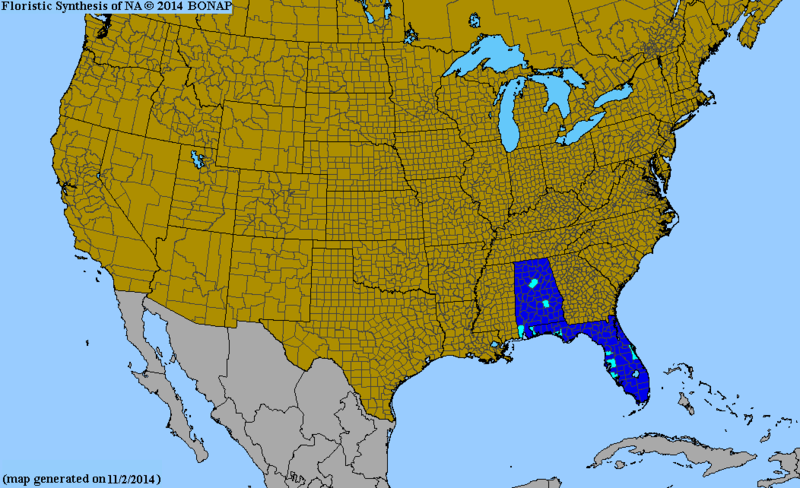 1847, nom. illegit. BASIONYM: Podocarpus maki (Siebold) Siebold & Zucarini 1846; Podocarpus macrophyllus (Thunberg) D. Don, subsp. maki Siebold 1844. USA Florida Hillsborough Co. 05 Feb 1999 R. P. Wunderlin s.n. USA Florida Miami-Dade Co. 26 May 1964 F. Rich 85 CULTIVATED.